Sara Ann is a Heard 28 built as a cruiser by Martin Heard in 1991/2. The hull is glass fibre but cabin deck and spars are all wood. She is 28ft plus 11ft bowsprit and carries a sail area of about 650 sq.ft plus topsail. With a displacement of about 8 1/2 tons and 65% ballast ratio she is pretty stiff requiring the first reef in about force 5. She has cruised as far as Brest and Sweden (at least two others have crossed the Atlantic). Terry Heard followed by his son Martin built a large number of these Falmouth working boats, initially just for oyster dredging under sail on the River Fal. 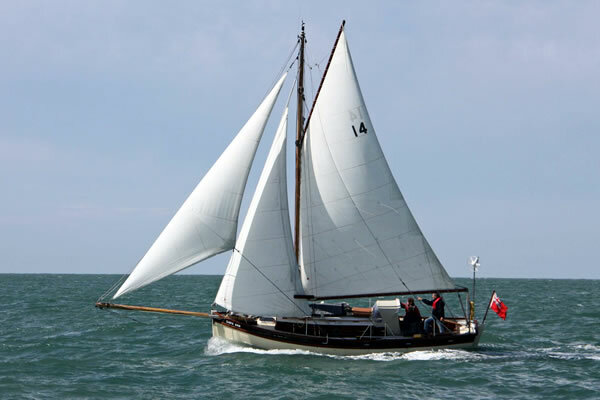 However, they quickly became popular as cruising boats or purely for racing in Carrick Roads (with a bigger rig). Although all the 28s are similar, no two were fitted out the same and even the hull shape has changed slightly over 40 years in production. Currently owned by Richard Watters.